Jimminy Cricket once said, "When you wish upon a star, makes no difference who you are. Anything your heart desires will come to you." I like to think that a whole lot of hard work and determination helps too. Life time marathon #100 done. And you know what? I PR'ed by 4 minutes! Right now I am on cloud 9, 10, 11, 12, 100. I LOVE YOU SAN FRANCISCO!!!!! Unless you've been living in a cave somewhere in the Appalachian Mountains, you probably know my story. 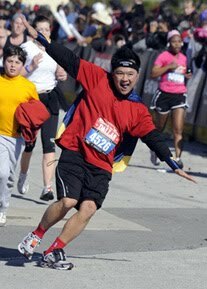 In a pistachio nut shell, I am the insulin dependent couch potato turned Marathon Caped Crusader. Four years ago, I thought I was having a heart attack, so I took my dog for walk around the block. That block turned into two the following day, then three, and before I knew it, I was taking long urban hikes all over San Francisco. Fast forward a few months. I had lost quite a bit of weight and was feeling great about myself. 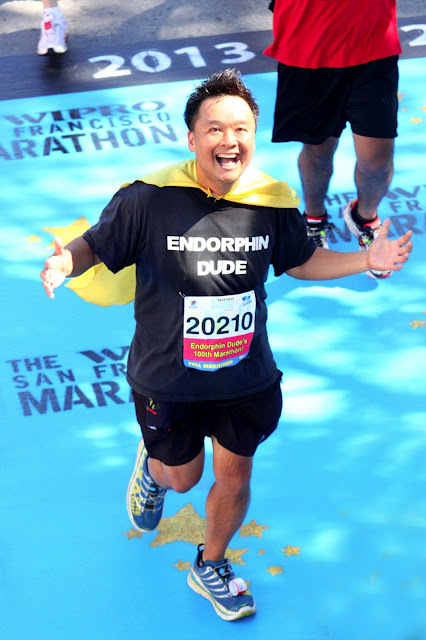 When a friend informed me that he was running the San Francisco Marathon, I said, "sure, I'll come cheer you on. How many miles is a marathon? 10?" 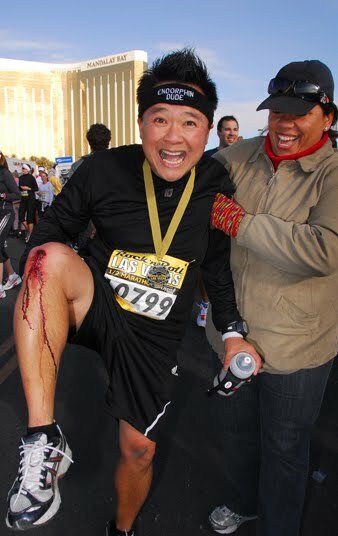 I knew nothing about running! I thought that a 10k had something to do with 401k tax forms! Nonetheless, I went to that finish line and cheered him on. As I waited for him, I felt the second hand runner's high from every runner coming through that finish chute. I knew at that moment that this was what I wanted to do. 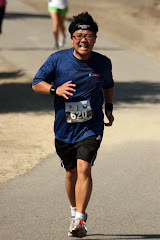 Of course, it was only fitting that I chose The 2010 San Francisco Marathon to be my inaugural 26.2 mile foot race. I trained for next 12 months for this marathon. 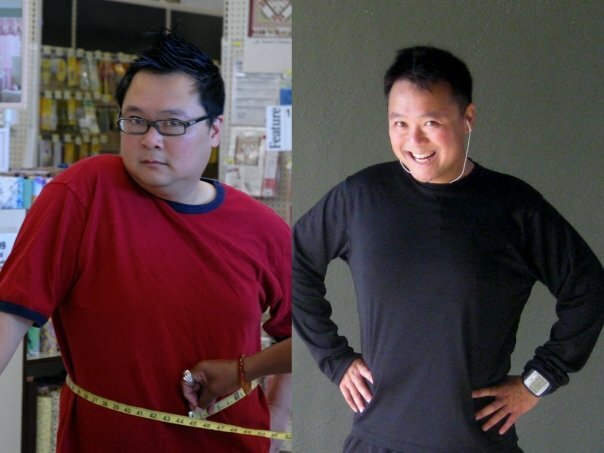 I came into that race with about 20 half marathons under my 32 inch waist belt. 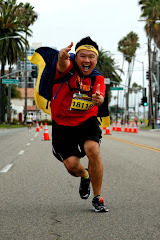 All I wanted was to run one marathon so that I could tell the world that I did it. This was supposed to have been a one and done bucket list item, but when I crossed that finish line, the endorphins pumped so hard through both my ventricles that I thought my heart would explode. The pain in my legs didn't seem to matter. All I knew was that I wanted more. 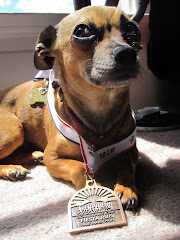 After I received my medal, I said to myself that I would run two more marathons so that I could qualify for the exclusive Marathon Maniacs club. I thought it would be cool to wear the yellow singlet like the varsity lettermen jacket that I could never have in high school. One month later, I ran the Extraterrestrial Highway Marathon and then a few weeks after, I earned my spot in the Insane Asylum by running the Santa Rosa Marathon, my third marathon in 90 days.What went from one and done bucket list item turned to three and done. Well, not really. 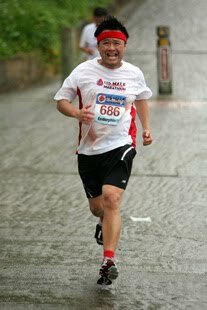 I went on to run marathon after marathon after marathon. I threw some ultras in there along with a bunch of half marathons. 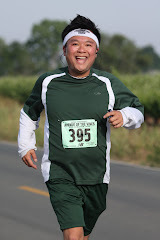 Every weekend I ran, and then I ran some more. The endorphins took over and I just couldn't stop. The stars all lined up perfectly for me to hit my 100th here. It is no secret that I love the San Francisco Marathon, and to be able to hit this milestone at the place that started it all is monumental. 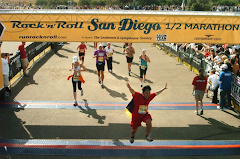 When I crossed that finish line, I really felt like my heart was going to explode. It was like the first time all over again. Never in 26.2 million years did I think that I would ever reach my 100th marathon three short years later. Along the way, I earned Titanium status by nailing 52 marathons in 52 weeks, knocked out not one but two 100 mile endurance races, completed over 110 half marathons, and found complete peace with myself. I truly like the person I have become. A healthy dude is a happy dude. Life is good. I crossed the SFM finish line this year right before you. 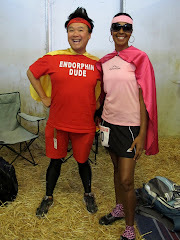 I only ran the 2nd half but I heard you exclaiming that it was your 100th marathon! I thought you said in 5 years though not 3. I'll have to update my blog where I mention you. I'm the person "living in a cave somewhere in the Appalachian Mountains." Dashing Dad introduced me to your story. Following now! Hi there Mr. Tony! This is your friend Jared! I'm still learning how to find people on this stuff and my Daddy lets me explore even though he doesn't really know that much about it. Anyway, I think you are an inspiration always to me and now I can share some inspiration with you because you are the coolest and Daddy thinks so too! Approximate Movers and Packers Charges, Cost, Price, and Rates. Get standard rates and quick estimations to compare and select the best service at affordable price.